Riverview Series benches fit public areas such as trails, parks, campgrounds, streetscapes, recreation centers, pools (indoor and out), and anywhere people are in need of comfortable seating with a touch of style. All Riverview benches incorporate armrests so they are more accessible. Choose surface-mount or embedded installations; fat, contour or double contour designs; powder-coated frames; plus five seat materials choices; many possible colors; and several lengths to create hundreds of possible variations to fit any design requirements. Using 3-foot or 4-foot modular components, you can build benches of any length you need. Are your locker room dispensers a mess? Are they falling apart and sitting in smelly goo due to a poorly designed mounting bracket? With product orders, Jade Distribution will treat your club to a free locker room makeover. Now you can get Jade's patented wall-mounted 32-ounce top-pump dispensing system free of charge. Jade also will imprint your full-color log at no cost. 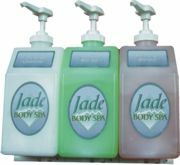 Jade Distribution is a one-stop-shop for all locker room amenities. Sloan's Flushmate® IV pressure-assist tank-type toilet was selected by BuildingGreen, Inc. as one of its Top 10 new green building products because of its environmental impact on saving water. The award recognizes the most innovative green building products added to the GreenSpec® Directory during 2004. A quiet-operation, one-gallon (four-liter) operating system for tank-type toilets, the Flushmate® IV uses 33 percent less water than conventional 1.6-gpf technologies. The Flushmate IV® system for High Efficient Toilets (HET) generates almost three times the flow rate of gravity units at 70 gallons per minute. United Receptacle's new Smokers' Pole provides a simple and neat solution to control smokers' waste. The clean lines of this modern design complement many of today's exterior decors, while occupying very little space. The easy-to-empty design detaches at the mid-point using a quick-release push-button, so minimum bending is required for maintenance. The modern design is constructed from fire-safe aluminum and features weather-resistant powder-coated finishes in black or silver metallic. New in Columbia's large line of passenger, industrial and commercial vehicles is the Eagle SE model passenger vehicle. The Eagle SE features 175/50 R13 DOT-rated radial tires on chrome wheels for a sporty appearance around town. Columbia also has upgraded the suspension for the SE model to its new Luxury TrackTM suspension, providing the SE passenger with a softer ride. With its raised profile of approximately 5.5 inches of ground clearance, the Eagle SE rides like a dream. Standard features include automotive-style rack-and-pinion steering, independent front suspension, adjustable camber, and a high-strength tubular frame with a lifetime warranty. RMT Aquatics manufactures an extensive variety of lifts to facilitate the transfer of people with special needs into any pool, spa or boat. The PAL Portable Aquatic Lift is a completely portable, battery-powered lift that is the ideal solution for locations with multiple pools and/or spas. The Splash! Lift is a semi-portable, battery-powered lift that is mounted to the deck by a deck anchor socket. All RMT Aquatics lifts comply with the ADA guidelines for accessibility. 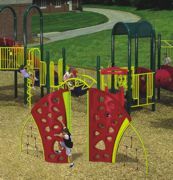 Take your playground to the next level with the MaxClimb Keystone Cable Climber by Park Structures. The MaxClimb Keystone Cable Climber is a truly innovative combination of cable and sculpted plastic that is available as an attachment or as a freestanding item. The climber is challenging and fun for children, while allowing supervisors full visibility through the panels via its specific open handhold design. The component offers solid-surface vertical and lateral climbing, as well as cabling that creates a different experience with each step. All aboard for fun with the new Little Buddies Express Train where everyone travels first-class. Specifically designed for the little hands and feet of preschoolers, the train encourages safe play with larger openings and inside space for supervisors and parents to comfortably engage in pretend play alongside children. Offering versatility, the engine with a realistic "clanging" bell, tanker tunnel car, dining car and sandbox car are sold individually or together. The sturdy steel and plastic components are offered in bright color combinations of blue, yellow, white and red.